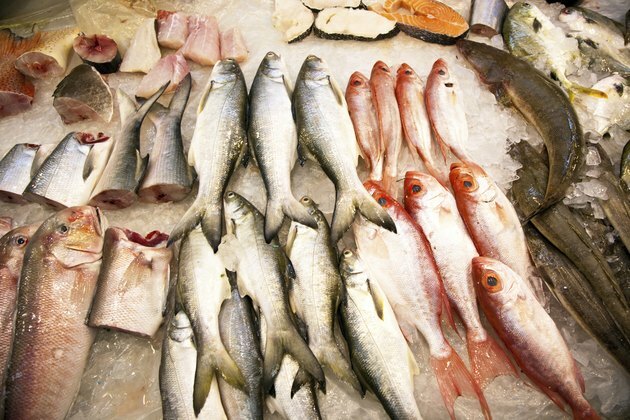 Many people want the health benefits fish provide, but they don't enjoy the flavor. To prepare fish that doesn't taste like fish, it is important to select varieties that have a less fishy smell because olfactory cues -- your sense of smell -- are strongly tied to sense of taste. Less fishy fish include meaty types such as halibut, swordfish and yellowfin tuna, and flaky types such as cod, salmon and mahi mahi. It also is important to marinate your fish fillets in a robust combination of flavors to reduce fish flavor. Combine lime juice, soy sauce, mustard powder, garlic, ground pepper, green onions or shallots, brown sugar and 1/3 cup extra virgin olive oil in a mixing bowl. Mix well, then set set aside. Place fish fillets into a baking bowl and pour marinade over them, soaking well. Marinate meaty fish fillets for up to an hour. Marinate flaky fish fillets for about 20 minutes. Refrigerate fish while marinating to prevent bacterial accumulation and lessen the risk of food poisoning. Create an aluminum foil pan rubbed with extra virgin olive oil to cook flaky fish on the grill. Flaky fish are cooked in this way to prevent the grilling process from breaking apart delicate types of fish irreparably. Coat the grill rack with nonstick cooking spray if preparing meaty fish. Preheat the grill to 350 degrees F.
Place the aluminum foil pan containing flaky fish onto the grill and cook, turning once until light and flaky on both sides, or about 15 minutes. Cook longer if fillets are thick. Put meaty fish directly onto grill rack, turning frequently to caramelize and to avoid burning, for about 10 minutes. Cook longer if fillets are thick. Baste both flaky and meaty fish throughout the grilling process with leftover marinade. Remove fish from the grill and serve while hot. To broil fish instead of grilling, keep marinated fish fillets in the baking pan with the remaining marinade and broil fillets for about seven to 10 minutes on each side, or until fish appears done. Properly cooked flaky fish will flake when gently cut, and meaty fish will emit clear juices when cut. Serve cooked fillets and any remaining cooked marinade with caramelized onion basmati rice, a hearty salad and lavender-infused lemonade. Mix 1 tbsp. of dill into breading or batter to help reduce fishy taste in fried fish. Fish is highly perishable and should be used at the height of freshness whenever possible to avoid food poisoning. Fish should be thoroughly washed and cooked as raw fish may contain deadly pathogens for children, the elderly, pregnant women and immuno-compromised individuals. Additionally, fish higher on the food chain, such as swordfish and halibut, may contain higher levels of heavy metals than is desirable for pregnant women to consume on a regular basis. "The Encyclopedia Of Healing Foods"; Michael Murray, N.D.; 2005.